Um… HELLO, Gorgeous! Really, is there any other way to open this post? You could honestly use that greeting for each & every image, because this romantic pink, coral & gray bridal shower is just jaw-droppingly beautiful in every way… I think the wedding might even be jealous! 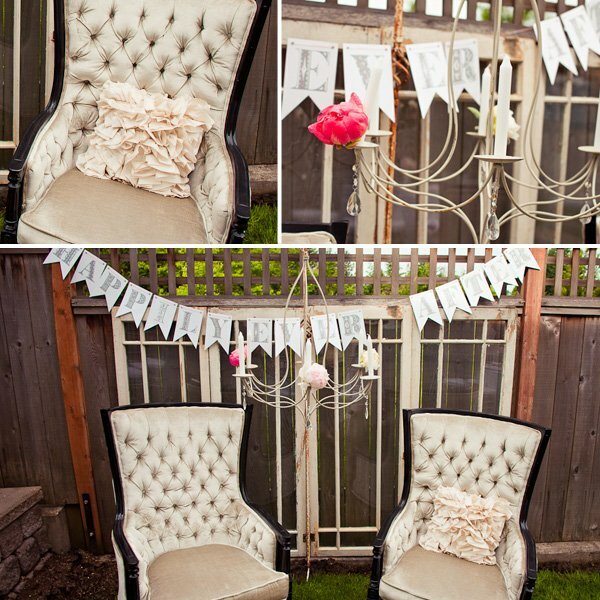 *wink* The shower was designed & styled by some lovely ladies in the bride-to-be’s life: her twin sister, Lindsey (Double Take Event Styling), mom D’Lorah, and friend Jessica of Modern Moments Designs (who also happens to be a contributor at HWTM!). There are so many gorgeous details to be found here that it’s honestly hard for me to decide where to begin… from the bold chevron pattern (which provides such a fabulous, unexpected contrast to the soft, feminine details) – to the many sparkly, romantic elements like fluffy pink peonies, milk glass vessels, hanging crystals, vintage frames & suitcases – to the creative handmade details like paper rosettes and “bride to be” spelled out in scrabble letters… suffice to say, no charming detail was left undone! 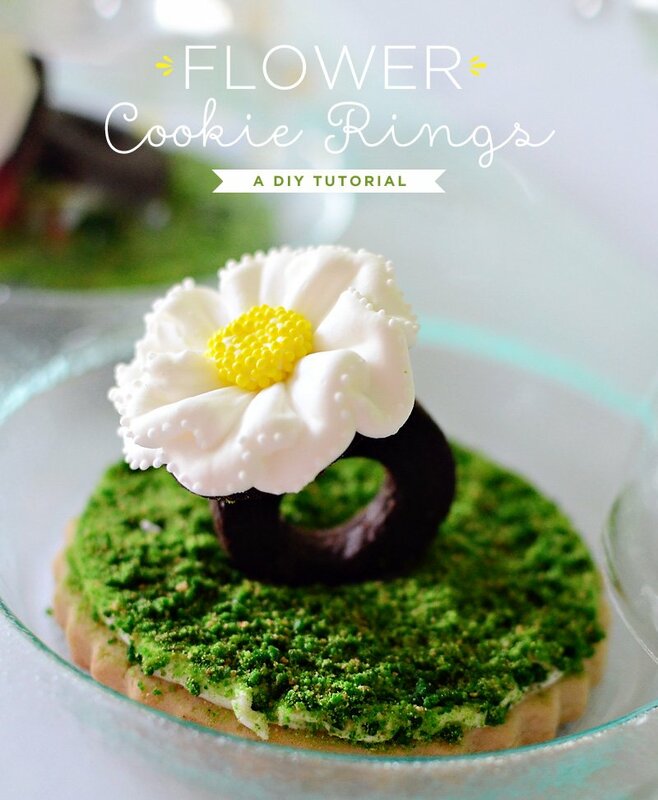 “Wedding season is upon us and that means lots of bridal showers. 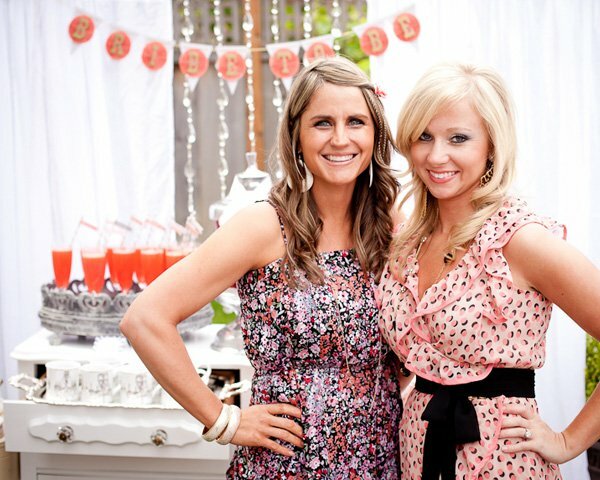 My dear friend, Laura is getting married in August and her twin sister, Lindsey was in charge of throwing her a beautiful bridal shower. She started planning months prior, which is a good thing because we had a lot of work to do! I was lucky enough to help out with the designing and styling. Lindsey took inspiration from many different places, but Paige of Paiges of Style was a huge inspiration to us all. Lindsey wanted the shower to be romantic and stylish. 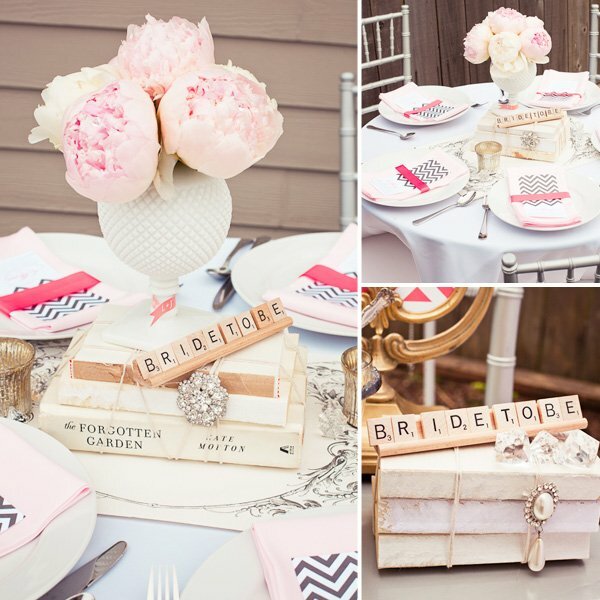 Her color palette included shades of gray along with pretty corals and shades of soft pink. Lindsey also wanted to include many vintage pieces to tie the theme together. We also added the chevron stipe pattern for a clean and timeless feel. The shower was held in a terraced backyard. It was a very intimate bridal shower with 30 of Laura’s closest friends and family members. We served brunch along with many sweet pastries and desserts. The shower featured the main food table and a drink bar. 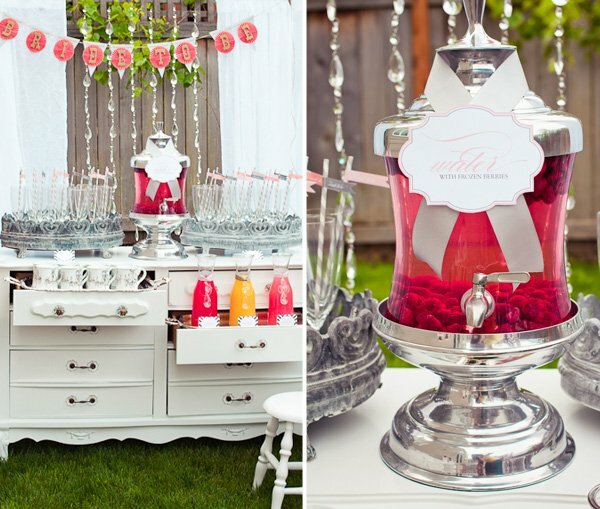 Lindsey styled and designed this whole fabulous drink area. The incredible table came from a second-hand store. Lindsey, along with the help of her Mom, did an incredible job refurbishing it. It looked so amazing and to think they only bought it for $30, what a steal! Since the party was outside, we still wanted it to feel warm and inviting. 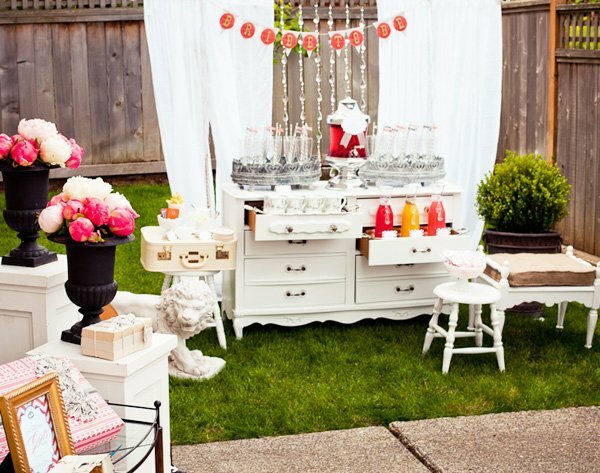 We set up several vignettes throughout including the seating area, gift station, and of course the bar. The backyard really went through a major transformation and looked so beautiful! Each table was also styled. The centerpieces were comprised of bundles of books. The mother-of-the-bride, took paper back books, removed the covers, and tied them with twine. She also incorporated scrabble tiles that said “Bride to be.” She pinned beautiful vintage broaches on them, which happen to be the broaches that will be on the bridesmaid bouquets for the wedding. We then topped the book bundles with beautiful vases full of peonies. 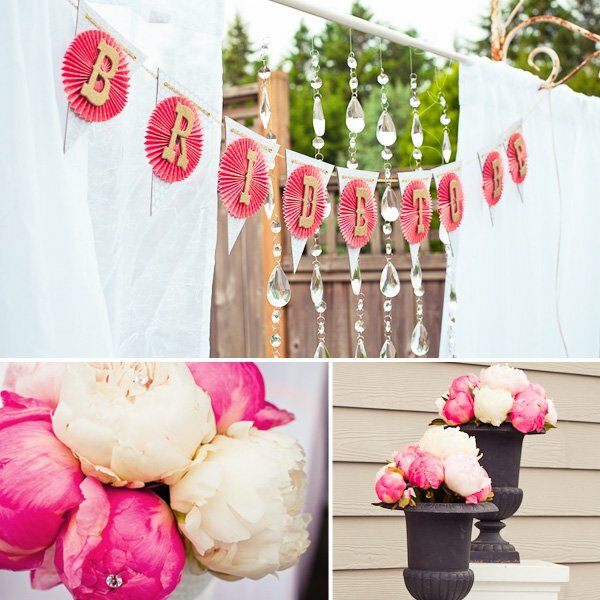 In the center of the peonies we placed floral pins to glam them up a bit. 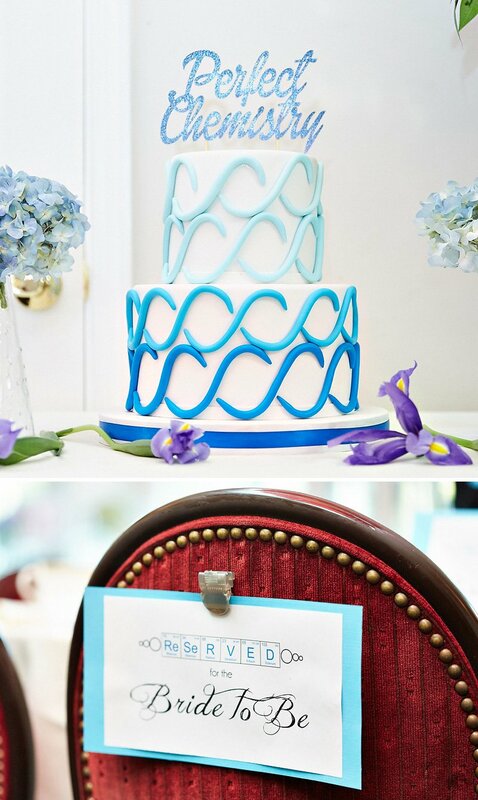 Lastly, we we used the same flags that we used on the straws and placed those around the base of the vases. They were stunning! Thanks to all the people who helped make this shower possible. We seriously had a whole group of people who selflessly pitched in. We couldn’t have done it without each and every one of you. We spent countless hours cutting, gluing, and making sure every detail was perfect! Ready to see more? Check out Part 2 right here! I’m over the moon for this! 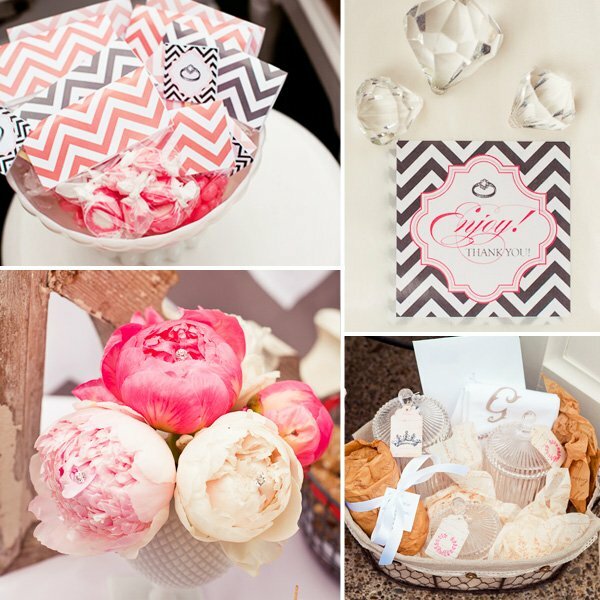 I’m a milk glass junkie, not to mention I am obsessed with all things chevron right now! Gorgeous!!! Not a huge chevron fan but I love this shower!!! 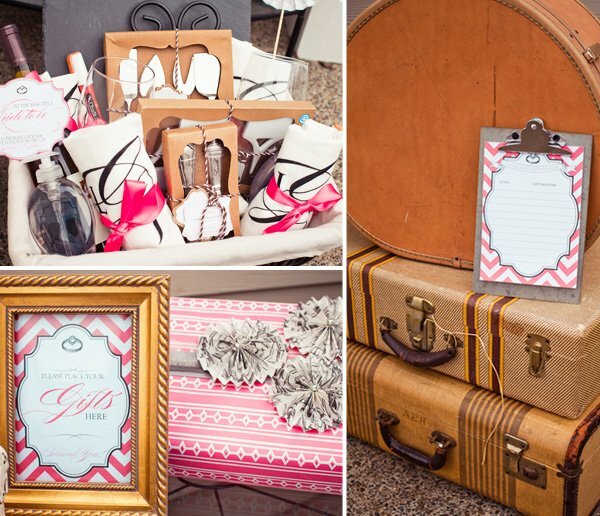 She used all of the trends that I’m loving right now…furniture, luggage and BLING! Absolutely gorgeous! Can’t wait to see part II! So beautiful! Love every detail. Gorgeous! Love the color palette! Dear Jessica, this is beyond gorgeous! 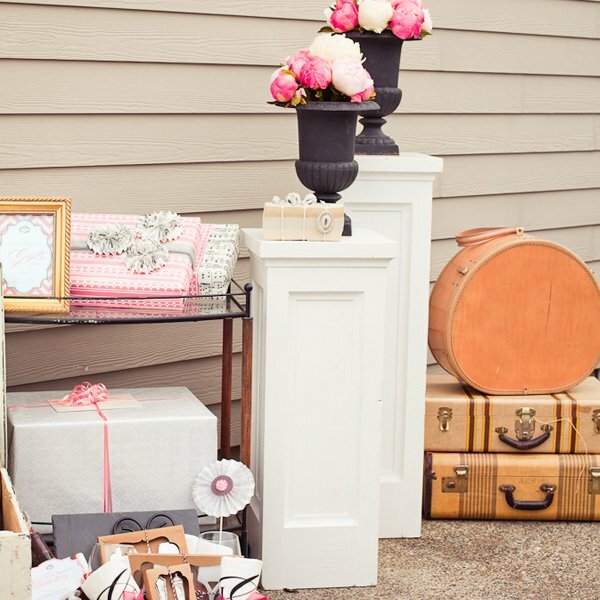 Love how you combined the vintage with the modern! love this! could you tell us how you did the raspberry water with some berries floating and some sinking? looks amazing! abd gorgeous! love all the details and the whole set up. Beautiful! Curious where you got the beverage dispenser? LOOOOOOOVE!!!! And Chevron and is one of my favorite patterns and they used it beautifully in this shower! oh love this spread! 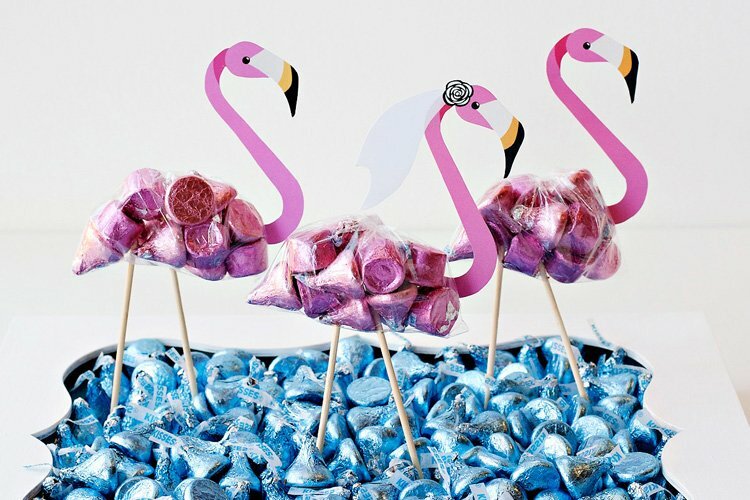 i just got gray & white straws for my wedding from http://www.graygoose.com. any thoughts on where i could find that crazy urn or something similar? Would love to help you out. What urns are you referring to? SO unbelievably OVER THE TOP fabulous!!!!! Absolutely stunning and inspirational! 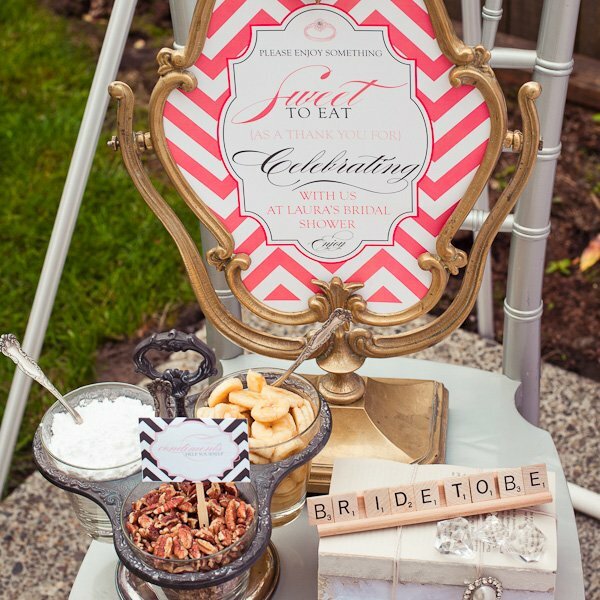 I can’t imagine how I would respond to a bridal shower put together in my honor that looked like this. Just amazing!!! This is incredible. I am currently working on my best friends vintage bridal tea party and I’m so freaking excited about it! Where on earth did they get that crochet bride to be crown!! I’m in LOVE! Wow, I love the take they’ve done on this. Just beautiful! And what I wouldn’t give for those magnificent frames! They’re stunning! So beautiful! 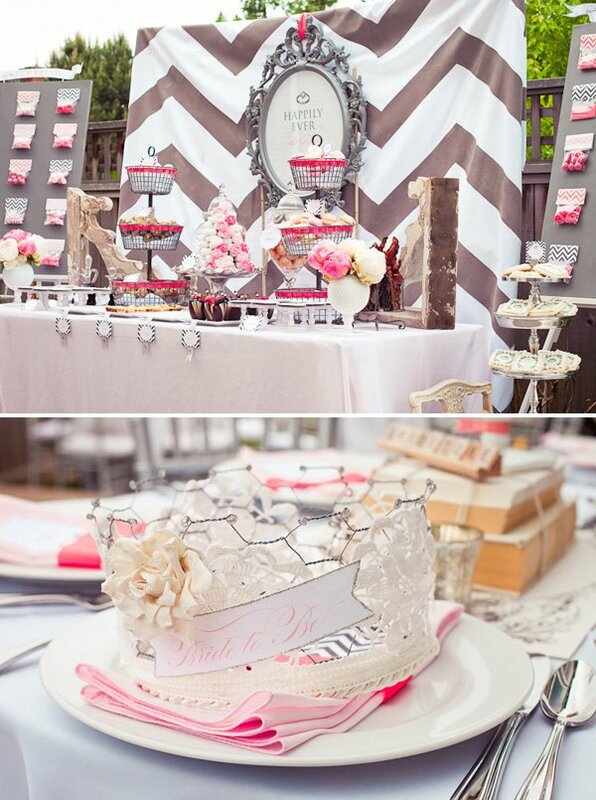 I love all the chevron details! This is gorgeous! Talented stylists, photographer, and designers! 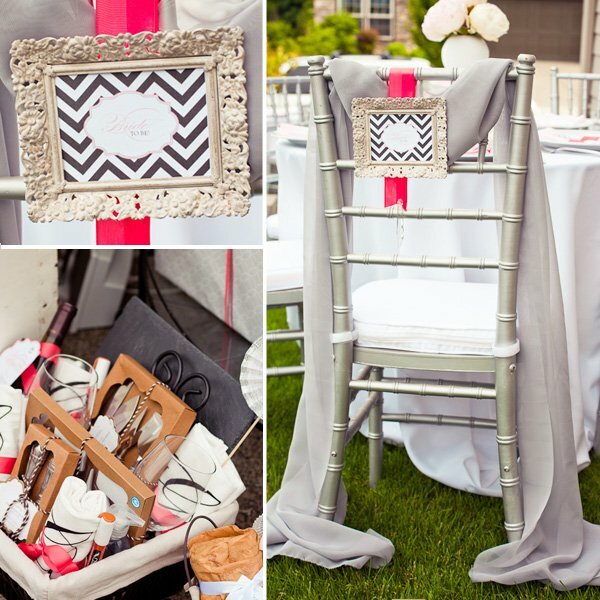 Love the chevron print and gorgeous crystal accents! This is STUNNING. Love every detail. Gorgeous party ladies, every detail is truly amazing! 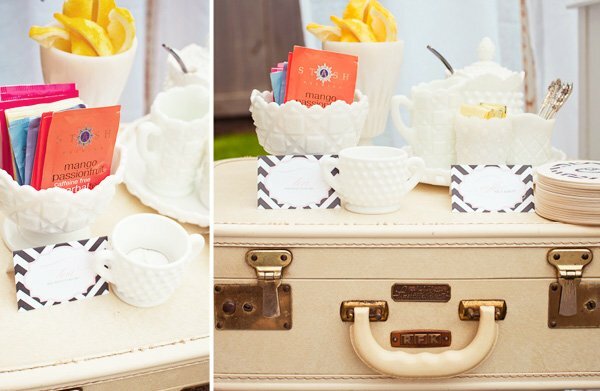 In two of the pictures do I see a picnic gift basket of sorts? I’m in love with gift baskets, so could you post more pictures of the basket or send me more pictures of it? I’d love to get ideas from what you ladies included in it, it looks absolutely lovely. We were wondering were you purchased your hanging crystal garland. We LOVE it and think it is perfect for our vintage, modern with a touch of bling. Thanks for any info you can provide us. 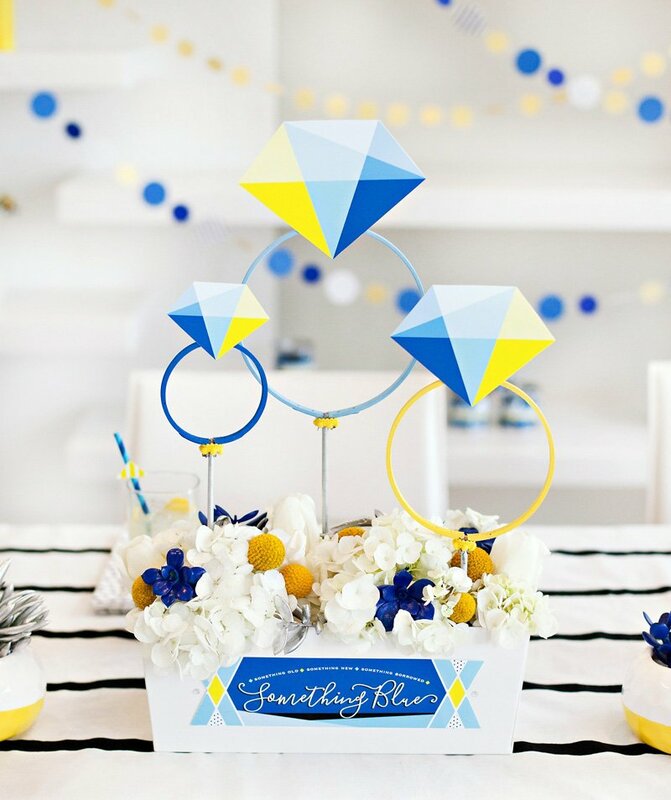 We purchased the crystal garland from Save on Crafts (Save-on-crafts.com). 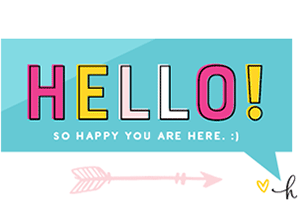 All graphics and printables were designed by the lovely Jessica of Modern Moments Designs. Please visit her website at http://www.modernmomentsdesigns.com. I LOVE THE CROWN! Can you tell me if it was homemade or purchased? I would love to have one if you have details on it. Thank you so much! I would be completely honored if my shower looked like this when I walked in. Cheers on a fabulous, and very special, theme design. Love this shower! 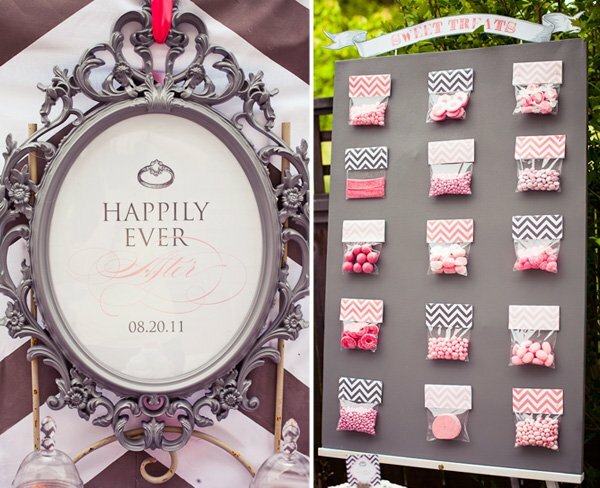 Do you mind sharing which fonts you used for the “Happily Ever After” banner as well as the food tags? 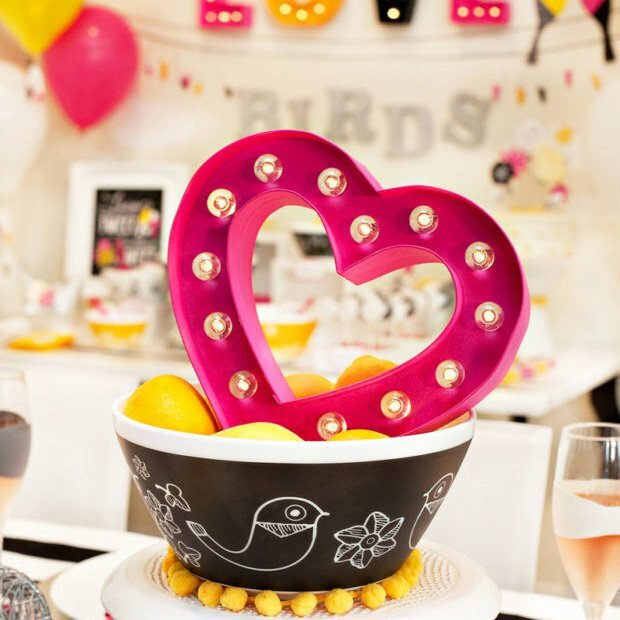 This is such a gorgeous and detailed bridal shower theme. It must have taken a lot of time to prepare but it was well worth it. Just amazing.